Near East apparently can’t help itself from misleading consumers, placing a Non-GMO Project label on its original couscous. This product’s only ingredient? Durum wheat semolina. There is no GM durum wheat semolina on the market. 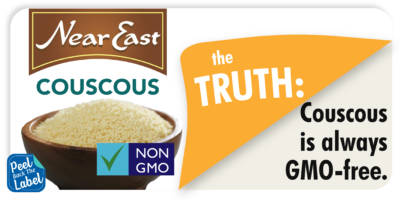 So why is Near East trying to make their product distinct by using the non-GMO label, when it is in no way different from any other plain couscous? Capitalizing on public confusion over what couscous is, and elbowing aside the competition are the likely reasons. healthier options. Near East has to explain that couscous isn’t pasta to remain relevant and make the case that their product is a healthier alternative to the very thing people mistake them forwhile they compete with other brands selling similar pasta alternatives. That’s a lot of work. Under those circumstances, what’s a quick way to stand out? Slap a non-GMO label on something that’s already GMO-free. And that’s shameful. Through minimal internet research, anyone can quickly discover that Near East’s non-GMO label is absurd and unnecessary. But, Near East counts on you to NOT do that research — so they can make a quick buck by scaring you into buying their product. Near East’s marketing gimmick may be effective, but if their manipulation grinds your gears, you can fight back. Raise your voice and tell Near East that they should stop their misleading labeling. You can send them an e-mail here, leave a Facebook comment or send them a Tweet.